We’ve looked at various shades of blue since I started this series of Pantone posts. It’s such an amazing colour and there are so many variants. From the greenest, turquoise to the darkest tone of indigo, the colour blue covers an amazing spectrum. We’ve already looked at Aquamarine; an ethereal powder blue. Not actually what I’d call Aquamarine — and not a million miles away from this shade — but I guess Pantone (the colour gurus) know what they’re talking about! Next was the turn of Scuba Blue. A yellow based blue; the most perfect turquoise shade, reminiscent of Caribbean waters. And last we looked at Pantone’s Classic Blue. A lovely rich navy — the perfect pairing with crisp white — and a great alternative to all of the dark grey that we’ve seen over the last few years. A shade that manages to span the centuries and work in a traditional setting, just as well as a more contemporary interior. So today is the turn of Pantone Dusk Blue. The last blue in the Pantone colour palette for Spring and Summer 2015. This shade is lovely. Smokey and chalky, with just a hint of red.It’s a lovely relaxing shade and reminds me of Cornwall, weirdly enough! Probably because it’s *almost* the exact shade of the iconic Cornish Ware ceramics. Here are my favourite home picks in this lovely blue. It’s such a fresh shade. Makes me think of blues skies with billowy clouds, forget-me-nots and bluebells. And looking at this little collection, above, a gorgeous country kitchen with windows over looking the sea. A girl can dream eh? I’ve created a little Pinterest board with some more Dusk Blue inspired pins. Pop and have a look if you get a chance. 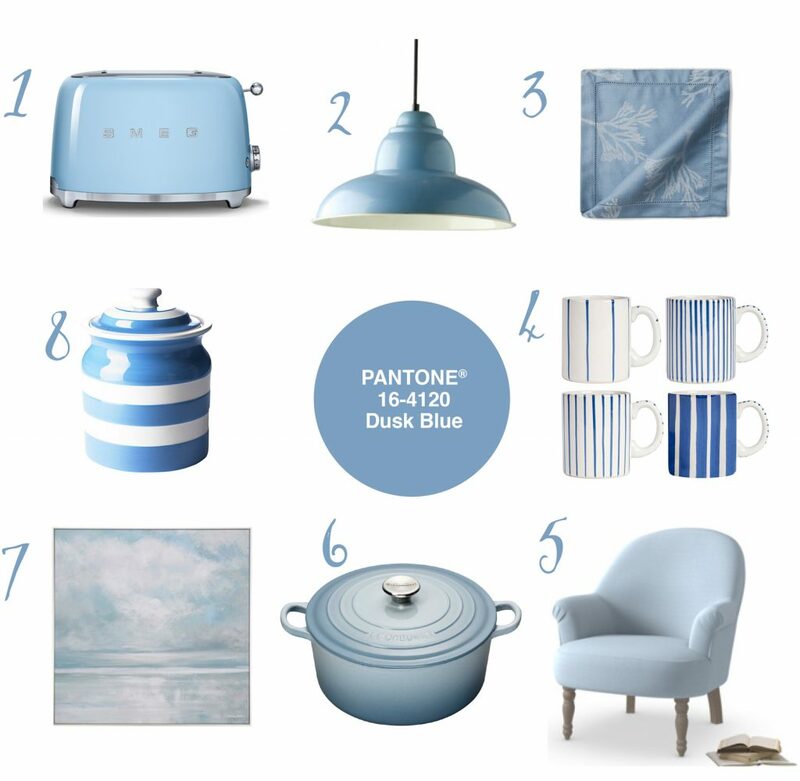 Follow Twinkle Diaries’s board Colour Your World | #12 Pantone® Dusk Blue on Pinterest. That is just the kind of light fitting I want for over the kitchen table. The Bavarian is yet to be convinced. Somehow I think I’ll just have to take matters into my own hands and replace it when he’s away. It is restful isn’t it? I think because of the associations… water, the sea, the sky… brings you a little closer to nature which is always very calming. I love this idea for a series! We are in the process of buying our new family home – hopefully forever home – so I’ve been lost in Pantone colours for days now. I love this blue, it’s perfect. I’m hoping to use quite a big of grey, but maybe I’ll have to sneak this in somewhere.